No Embossed "H" vs. Embossed "H"
before Chartreuse do not have the "H". Celedon Green, Gray, and Harlequin Yellow. -Has the distinctive "Dimple"
-Incised mark -Has Embossed "H" on bottom. the handle meets the body. the handle meets the body. Dry Foot: The foot (bottom) of the piece is wiped clean of glaze, having no sagger pin marks. Embossed Mark: Molded designs or letters that are raised above the surface of the pottery (i.e. Embossed "H"). 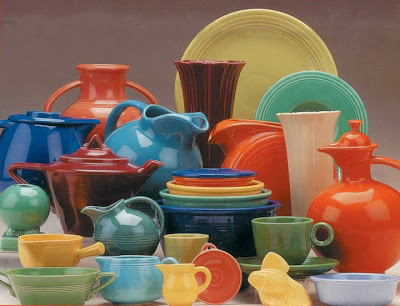 Vintage Fiesta® dinnerware was made with semi-vitrified clay. This means the clay is more porous making the product lighter and more fragile. Contemporary (P86) Fiesta® dinnerware is made with vitrified clay. Vitrified clay is less porous, leading to a more durable product that won't absorb odors or moisture. Due to the firing process, the finished product is slightly smaller than Vintage Fiesta® items. I don't see a Pale Yellow on the Post 1986 Dishography Graphic...???? I meant to reply to your comment, but accidentally added it as a new comment rather than a reply! It's there. 1987, Yellow. There's no "pale" yellow. It is very pale, but it's just called yellow. The graphic chart has a very vivid color on it - not at all the pale of P86 yellow.